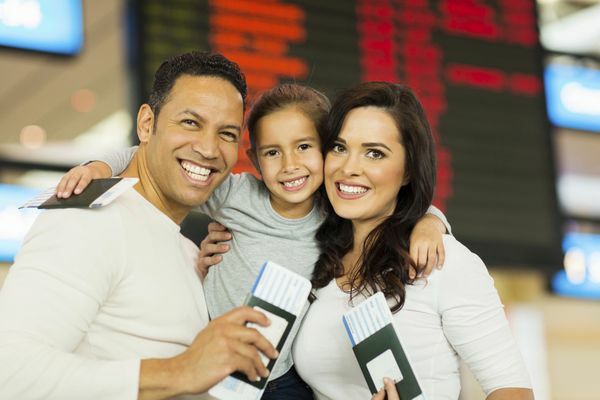 Folks paying for more than one airline ticket could save hundreds of dollars booking through Citi ThankYou Portal. Sometimes airlines only have 1 ticket available at a certain price. This means the 2nd passenger on your trip might have to pay more. But, there’s a secret way to book so the 1st and 2nd passenger get the same price! Family Trip? You’ll Want to See If This Secret Can Save You Hundreds of Dollars on Paid Airfare! My friend used this secret to book 2 JetBlue Mint (Business Class) tickets and saved $300! I’ll explain how you can take advantage of this trick! This secret might work on many airlines. I’ll use JetBlue as an example because my friend had success with this booking method. First, you’ll want to find the cheapest paid flight for 1 passenger. You can search directly on the airline’s website or by using ITA Matrix or Google Flights. For example, I searched JetBlue for a one-way flight from New York (JFK) to Los Angeles for 1 adult. The results show only 1 coach seat available for $318. When I do the same search for 2 adults, the price for both passengers goes up to $380 per person. 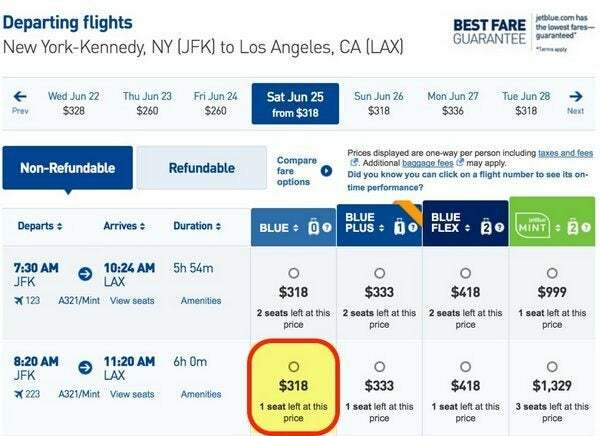 Because there’s only 1 seat available at the cheaper price, you could book separate flights through JetBlue. The first passenger’s ticket would be $318 and the second passenger’s for $380. Wouldn’t it be nice to get both tickets for $318? To get 2 tickets for the cheaper amount, you’ll need to book the 1st ticket through the Citi ThankYou Portal. I’ll explain why in a minute. For access to the ThankYou Portal, you’ll need a Citi credit card like the Citi Prestige. Or you can get access with an eligible Citi checking account. 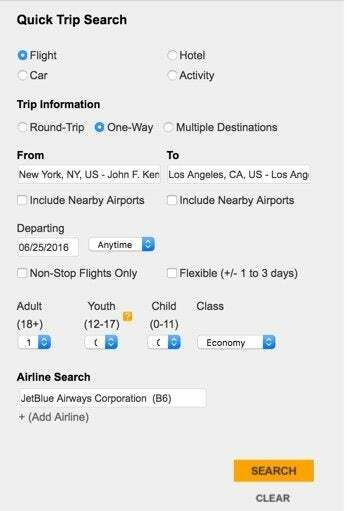 Using the Citi ThankYou Portal, I searched the same JetBlue flight from New York (JFK) to Los Angeles for 1 adult. The results are the same. One seat available for ~$318. You can pay for this $318 flight with a credit card. Or, if you have Citi ThankYou points, you can apply them toward the flight cost. You’ll get a rate of 1.33 cents per point if you have the Citi Prestige through July 23, 2017, or 1.25 cents per point if you have a Citi ThankYou Premier. After paying, you’ll get a confirmation with your flight reservation information. Now, you’ll have to act quickly to book the 2nd passenger’s flight for the same price. There’s a delay between the time you book the 1st flight through Citi ThankYou Portal and updates to JetBlue’s available seats. This means after you book the 1st flight, you can quickly go to JetBlue and find 1 seat available for the price of the 1st ticket. Citi ThankYou Portal and JetBlue initially showed only 1 seat available for $318. But, after booking 1 ticket through the ThankYou Portal, JetBlue still shows 1 available seat at the same price. Go ahead and book the 2nd ticket on JetBlue and you’ll have both tickets for $318! Like anything in the miles and points hobby, nothing is guaranteed or lasts forever. While this trick works with JetBlue, it may or may not work on other airlines. 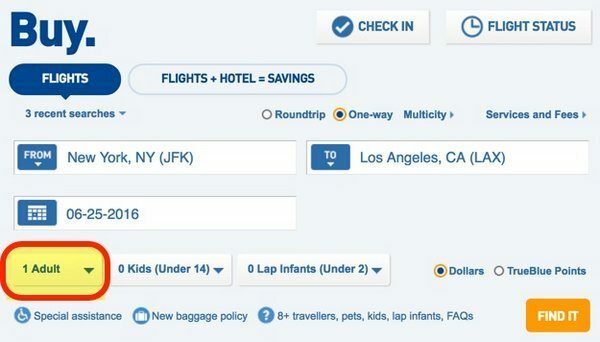 There’s a secret way to book paid airfare for multiple passengers to save money. If there’s only one cheap seat available according the airline site, you can book it through Citi ThankYou Portal. Then quickly book the next ticket at the same price directly on the airline’s website before it updates. 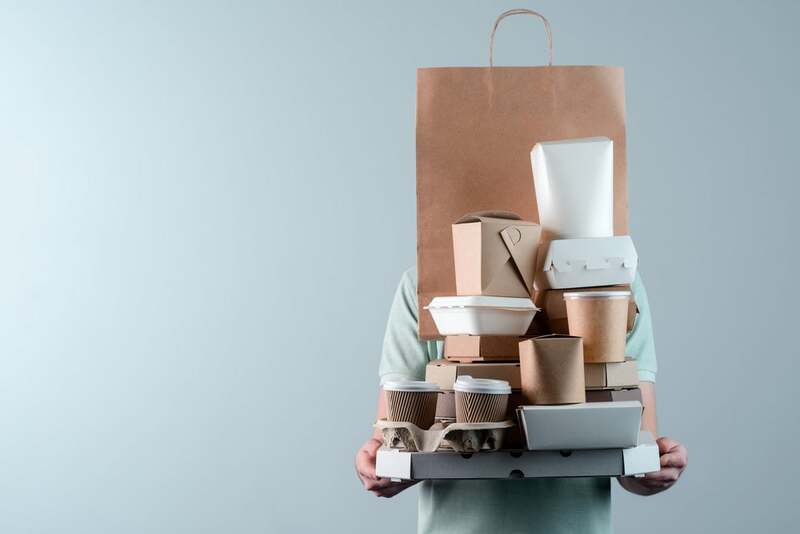 This method might not be for everyone. But, it could potentially work on many airlines and save you hundreds of dollars. If you’ve booked airfare this way, I’d love to hear about your experience! it took the reservation for 3 adults till i hit purchase then error message showed?? I called into jetblue and the SECOND supervisor honored the fare for all 3 people. afterwards the website showed no seats available,jetblue blocked the date off??? persistance pays off as well as loyalty to jetblue! I tried something like this using pay with points on the Chase and Citi for an Iberia flight. I’m pretty sure I booked the Citi flight first and quickly tried to buy from Chase but the seat was gone for that price. You don’t even need to use citi portal…Just open the website in incognito mode twice and search for the ticket in two different tabs or open one tab on your laptop and another on a tablet. After adding the details , hit submit at the same time and you will have 2 tickets at low price. I have tried this and it works. I recently took an extended trip around SE Asia with my stockpile of Thank You points. I found that more often than not the price airline tickets using the Thank You portal was 20%-500%!! more than booking elsewhere. Yes, once a ticket on Vietnam Airlines was 5 times as much as booking directly online from the airline. Also, hotels were often 20%-50% more than other travel sites. I found it difficult to get a value of 1 cent per Thank You point during my trip. However, free travel is still fun. YMMV.